Mittens Writes: Reading Allowed...uh, I mean aloud. I've been reading my current ms out loud to find awkward dialogue, bad grammar, and places where words might be overused. This has been very helpful. I can't tell you how many times I'll be reading along, and SAY a different word than my eyes SEE. I usually end up changing the word to the one my ears told me would sound better. I'm pleased with the results, so far. I've also started noticing some strange things about my characters. I thought I just made most of them up out of whole cloth, but obviously that's not how brains work. We create characters out of a mish-mosh of people we know, and people we know of, like characters from TV shows and movies. Once I got over the idea that I hadn't actually created my little imaginary friend, but cobbled her together from various sources, I've been racking my brain since then to figure out who else donated a bit of their personality to Thalia. And then I started thinking about my other characters. I had a moment of additional panic when I thought ALL my characters were based on NCIS, but I realized that didn't really hold up. Though I think of Henry (Thalia's father-in-law) as a little Gibbs-y, it doesn't hold up as an accurate character description. So, relief. At least I didn't just pull my characters out of a single TV show. Now I'm officially on a quest to figure out who all my characters are based on. I asked the Helper Monkey what he thought, and he agreed he could see Ziva in Thalia. I also asked him if he could see any other similarities between my characters and any people -- real or imaginary -- we know or have seen on TV. He said, "Nothing leaps to mind," which translates as, "Can't you see I'm watching NASCAR? Can we have this conversation another time, like maybe when I'm asleep?" So I'll continue to think about the people I've created. I hope the rest of my imaginary friends are a little harder to figure out, though. So much for originality! 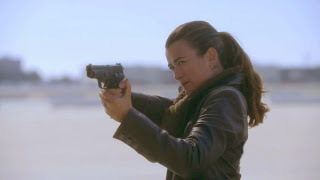 Thank you, Ziva, for inspiring Thalia for me, even if it was completely unintentional. At least you're a badass! Conclusion: I watch too much NCIS.